Beginners frequently want to know what kind of telescope they should buy when they come to our Beginner Meetings… reflector (mirror) or refractor (lens) scope, AltAz or Equatorial mount, manual or GoTo control. Every experienced observer has their personal favorite that they’ll recommend, hopefully based on the beginner’s interest…planets/DSOs, visual/imaging, fixed/portable…. 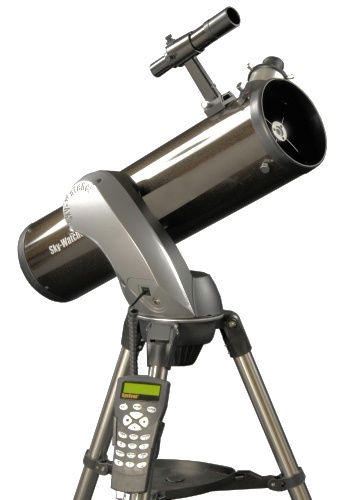 Experienced users frequently recommend the biggest Dobsonian telescope the beginner can afford. Just in case you don’t know, a Dob (pictured on the right) is a manual, Alt/Az mounted reflector. The new user has to starhop to find anything and constantly nudge the telescope to follow it. You litterally put one hand on the open end of the tube and push it around. Other than leveling the base no sky alignment is necessary. You have to learn the sky to get good with a Dob and may only see five objects a night until success really comes. A good star chart will become your best observing friend. Beginners demur thinking that it will be too hard or frustrating to star hop, that they won't see enough objects to keep their interest, and frequently opt for the latest GoTo model thinking that it will be easier in the long run since the telescope will do all the work. 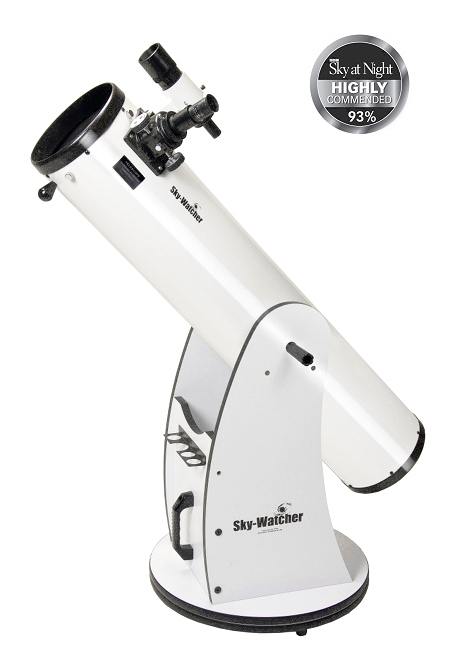 Nigel’s thread is called “SkyWatcher SynScan GOTO - What the Manual Doesn't Tell You!” and really should be a must read for anyone contemplating starting down the Astronomy trail and buying a telescope. While his original post is about his learning curve with a SkyWatcher [Synta] SynScan GoTo scope, his words are true for ANY GoTo scope a beginner would buy. Many others jumped on the eight page thread and seconded his words and shared their frustrations as beginners. One early poster said “The OP's [original poster’s] first post should be compulsory reading for all newbies!!! It would save many people frustration and money.” Another person on the thread posted "I agree that it's very easy to interpret GoTo ads as if GoTo is a magical telescope that springs out of the box and eagerly points at stuff. The same as detailed pictures of Jupiter's cloud systems (etc.) are often on chain store 700x76 packaging." There is no wonder that a beginner is confused. The GoTo scope Nigel purchased is on the left and has a 6" mirror. A considerable fraction of the price is for the computer inside the hand controller you can see dangling from the tripod. The scope needs electricity to run, either plugged into a wall or on a battery. For comparison purposes a similar priced (about £285.00--available in UK not the US) Dob with an 8" mirror is on the right. The main differences between the two are the GoTo scope has a smaller mirror and can GoTo. The GoTo is smaller and will easily fit in the trunk of a small car. The Dob will fill your back seat and the base might have to ride in your passenger seat. Both scopes are Alt/Az mounted Newtonian reflectors. The Dob can capture 1.77x more light than the GoTo because of the bigger mirror. More light means a brighter view and the ability to see dimmer objects. Since I've had my SW130p Alt Az Goto scope for almost a year now I thought I would write a little something for anyone thinking about a similar GoTo scope as their first step into astronomy. My thought process when I got the scope was probably fairly typical. I figured that the GoTo system would allow me to find my way around the sky fairly quickly without having to learn every inch of the night sky manually. I also had limited time for observing and thought that this scope would get me going much quicker from the start. Neither of these things turned out to be true. So before you make the choice to Goto or not to Goto here are a few things they don't tell you in the manual. (see the URL for the rest of the thread). Learn alignment stars…where they are in the night sky. Know which ones to use before you go out. Print out a list and star chart and have it with you whenever you observe. Manuals are universally bad! ("It's easy to say the manuals are not that bad when you're looking at them with the hindsight of experience. You should see them through the eyes of a noob!") --direct quote from the thread. If you do decide to go with a GoTo mount use a cross hair eyepiece for alignment for best results. When aligning your GoTo mount try to use stars that are at least 90 degrees apart. Always use your longest focal length eyepiece (the one with the biggest number... 25 is bigger than 10) after a GoTo. You'll have a better chance of finding your object in the bigger field of view. Once the object is centered move to higher powers (smaller numbers on the eyepiece) for a better view. An Alt/Az mount is much easier to use than an Equatorial one. With Alt/Az you don't need to worry about polar alignment...getting the mount pointed at the north celestial pole. Unfortunately, if you are interested in imaging you'll find that an Equatorial mount is a necessity. Try to learn one new alignment star every night you are out. A pair of 7x50 binoculars will make finding Deep Sky Objects much easier if you are star hopping. A finder won't help you find anything unless it is aligned with your main telescope. Find something with your main telescope first. Then adjust the finder so the dot or cross hairs match what you see with the scope. Avoid twisting/turning the nobs/screws on the ends of a Newtonian or SCT unless you know what you are doing. If you purchased an inexpensive telescope in all likelihood the tripod is the weakest part of the system. Anything you do to stiffen the tripod will help in the long run. Viewing should be fun. If it isn't, you are probably butting your head against a wall and need to ask somebody for some advice.